When it comes to HBV, age at infection matters. Most people with chronic HBV infections are exposed at birth or in early childhood, when they are most likely to develop chronic, lifelong infections — whereas only 2 to 6 percent of infected adults will develop chronic infections, with only 15 percent of them eventually dying from liver disease. 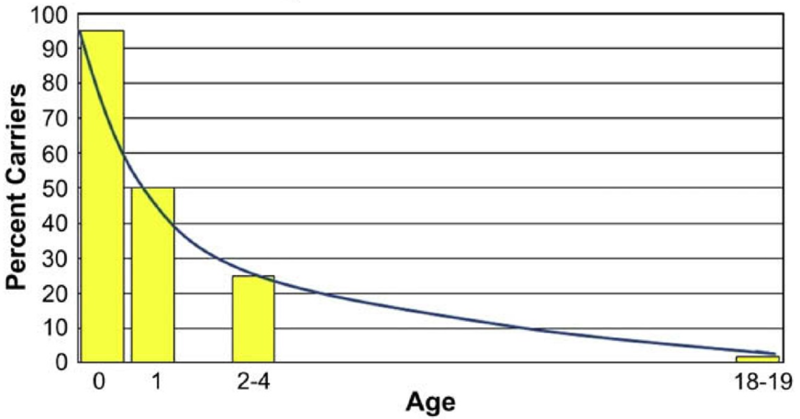 The fact that chronic infection risk is inversely correlated with age at infection means that birth is the time when a child is the most vulnerable to this virus — hence the importance of vaccinating as early as possible. The younger someone is when infected with hepatitis B virus, the more likely they are to become chronic carriers, putting them at dramatically increased risk for liver cancer. During pregnancy: About 1 to 9 percent of infants born to chronic carriers will be infected with HBV in the uterus. Most vaccination failures are thought to occur in infants who had already been infected during pregnancy. During childbirth: Labor and the trip down the birth canal exposes the infant to the mother’s blood and other infected fluids. This is the most common way a baby is infected with HBV. After childbirth: HBV can be transmitted from mother to infant through daily contact, for example by exposure to a mother’s saliva. But let’s not turn this into a game of “blame the mom.” Children can also acquire the virus from playmates or household contacts. In the course of exploring their new world, kids get their germs all over the place, and they can acquire the virus from exposure to bodily fluids, for example by sharing food. While sharing food is a sweet thing kids might do, they can also explore their worlds in less-than-sweet ways, and HBV transmission via biting has been documented. Additionally, because the virus can survive outside of a host for a week, it can be present on objects, like toothbrushes or nail clippers, or household surfaces, where it can enter a new host through microscopic openings in the skin. While the vaccine probably provides lifelong protection, we have evidence that it protects against HBV for at least 20 years, covering the time period during which a child is most vulnerable to developing a chronic infection. And those years are critical. Since so many early childhood infections occur with no known mode of transmission, early vaccination will protect a child if they encounter this hardy virus during daily life. Before the vaccine was recommended for all newborns in 1991, an estimated 16,000 American children per year acquired the virus before turning 10, but after they were newborns, showing that childbirth is not the only way that a child can be infected with HBV. Lastly, the vaccine stimulates a stronger immune response in babies than in adults — showing why vaccinated babies have an edge over people who receive the vaccination later in life. The vaccine came onto the market in 1982, but at first, it was recommended only to high-risk groups, including babies born to HBV carriers. Administering the vaccine and immune globulin to a high-risk newborn decreases that baby’s chances of developing a chronic infection by 95 percent. Unfortunately, only targeting risk groups didn’t have the desired effect on HBV incidence, which had increased by 37 percent between 1979 and 1989. In response, recommendations changed in 1991: All infants would receive the vaccination series. In the United States, between 1990 and 2004, new infections decreased by 94 percent among young people. Worldwide, in regions where HBV is even more prevalent, widespread vaccination campaigns have had even more dramatic results. Taiwan started a vaccination program for all newborns in 1984, and after 10 years, the HBV carrier rate in children decreased from 10 percent to 1 percent, and pediatric deaths from liver cancer were cut in half compared to 1981 rates. In his obituary in the New York Times, R. Palmer Beasley, who with his collaborators discovered mother-to-child HBV transmission and spearheaded research on vaccinating newborns, was credited with saving millions of lives. This is a vaccine that has tangible, real-world benefits, and is not just part of some “Big Pharma” conspiracy to poke holes in babies. The hepatitis B vaccine is safe and incredibly effective. Given how dangerous hepatitis B virus is, and how much disease and death it causes worldwide, eradicating it should be one of our top priorities — and mass vaccination can allow us to wipe hepatitis B off the planet, getting rid of a top cause of cancer. Instead of stigmatizing people with chronic HBV infections — and stigmatizing the vaccine right along with it — we can recognize the vaccine for what it is: an effective tool to fight cancer. This entry was posted in Pregnancy & Parenthood and tagged babies, birth dose, blood, cancer, carrier, childbirth, chronic infection, cirrhosis, conspiracy theory, Engerix-B, HBIG, HBV, hepatitis, hepatitis B, hepatitis B vaccine, hepatitis B virus, high risk, immune globulin, immune response, immune system, immunization, infants, labor, liver cancer, liver disease, nail clippers, needles, newborns, Pediarix, perinatal transmission, pregnancy, prevention, R. Palmer Beasley, risk behaviors, Taiwan, timely birth dose, toothbrushes, transmission, universal birth dose, vaccination, vaccine, virus by Anna C.. Bookmark the permalink.